So this week I finally started using delicious properly, which is something I wish I had started a long time ago. At the moment, for someone who is interested in service design and reading about it online, there is an infinite amount of material generated everyday in the form of new blog posts, discussions on networks and conversations via twitter. Today, I’m going to round up the best of what I’ve been reading this week, the rest, you can check out on my delicious links. I was interested in Joshua Porter’s article : Too many anecdotes, not enough data and the comments section when it is mentioned that an anecdote is actually one piece of data. The article talks about designers being careful about basing their decisions on one story, surely, as someone commented, many anecdotes make up data, and are part of a wider understanding of the situation we are able to make informed choices from this…I’ve been thinking about this one alot recently but I’ll post more indepth later. I then, through various links was taken back again to look at LEGO’s building block for Good Experiences. Have a look for yourself. 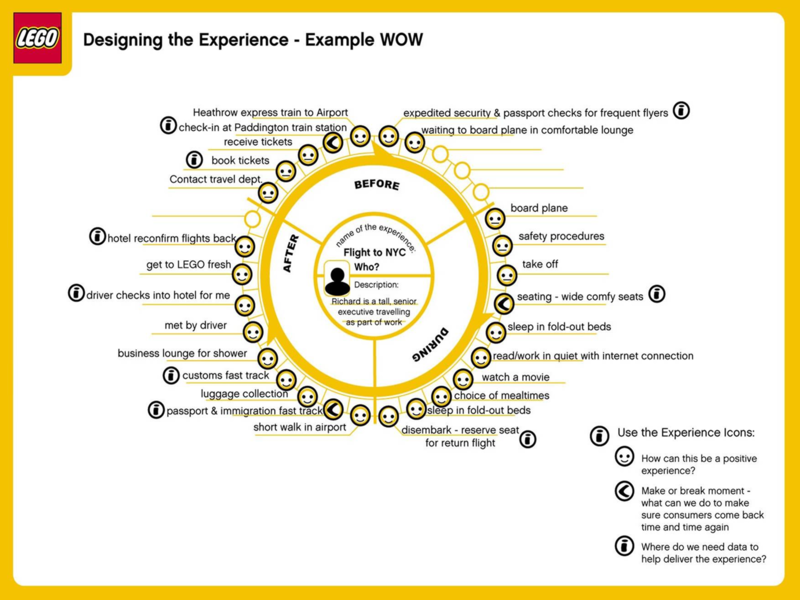 Tell me if I’m wrong, but I can’t help but think many of the service/experience diagrams I see would look much better with pictures, not to mentioned more rich in information. I have actually been considering coding a wheel that was rotatable, where you could insert pictures and it would automatically generate a linear/or other interesting mash ups of journeys. Just some food for thought. Much of the designers Fergus mentions are part of a ‘Design thinkers’ network on a ning based platform called Wenovski. If you haven’t joined already, its worth joining. I’m working on an article at the moment for my group, designing for the public sector. They also have a great interview this week with Jason Cooper who is starting a programme called Smallfish which is described as, Connecting micro-business with design students. I’m looking forward to seeing the results of Participle’s project, the Southwark Circle. Watch this space I guess. Fast Company put an article out that I only just got round to reading, ‘Thinking about design thinking’ by Fred Collopy, which is commented on by some great thinkers. If you haven’t got involved, join the conversation. I’ve been struggling with all the reading on What is design thinking? And been having some interesting conversations with ‘Product Design’ students from the GSA. We can’t help but feel the name of our course should be changed now, I think the term Product confuses onlookers to what we are taught and produce. I received some great books this week from Amazon and finally got back to reading some of them in my not so spare time. There are some great lists online of books to read and here too, recommended by those in the industry which is a great way to start learning about a discipline that has still not quite evolved in education, but is getting there. What’s great is that some of them are not particularly service design related but a must read for anyone interested in the field. Another great find this week was the Board of Innovation, a collection and DIY builder of business models, simply illustrated. I’m still to investigate this more but have a look. And just this morning, I came across on Twitter, Tessy Brittons portfolio site. Simple and clear, you can see what she is working on, there are some really great projects and initiatives there. There’s probably many more things I’ve come across this week but I guess that’s a rough round up. Please forgive me, I have been terrible at keeping up to date with my blog. I’m now full time working on mypolice at the moment, and what a full time job it is. I’m rather enjoying it, this is a real project and has been a great thing for me to get my teeth sunk into, and use all the skills I have learnt over the last 4 years at art school. I’m taking a rather service design based approach to the project, its difficult though with only me full time working on it which means I’m dealing with a lot of other things like the business side and contacts whilst trying to pull together a structure for our design process. I have a great team though and we’re meeting again on Friday so I’ve got lots of tasks to pass on and really get mypolice going.